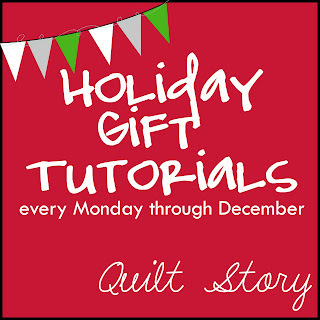 Quilt Story: Holiday Tutorials Galore! I don't know about you but I pretty much exclusively make all of my Christmas gifts (except for the little boys in my life, I can't make Razor Scooters or Lightning McQueen race tracks). I love the holidays because everywhere online there are amazing ideas to make for gifts! So...we thought we'd ask some of our favorite designer friends to share an original tutorial with us this holiday season, and they agreed! Wahoo! Any thoughts or ideas on things you'd like to see? If you make gifts, who do you generally make them for? What do you give to your crafty friends? Hi Heather and Megan! Great idea! See you Monday! Hey, if you missing guest spots? I can show my OWLS :-) well they ARE from a magazine but the pattern was in wool, I make them in scraps of cotton and a different technique. I would love to see quick and fun presents. e.g. mug rugs, pot holders, table runners. Sounds wonderful. We are always looking for fun and quick gifts for friends and family. Handmade ornaments are always fun to add to packages. Sounds fun - I look forward to it! I too make most of my gifts. Love doing it. Thanks for your post.